Le Grand High School valedictorian Daniela Ceja admires both of her parents for the culture and values that they have instilled in her. Daniela’s parents came to Planada, California, a rural farming community, from Michoacan, Mexico, to provide a better life for their family. She attributes her hardworking nature to seeing her father endure labor-intensive days under the sun as a farm worker. Additionally, Daniela attributes her passion for the community and culture from her own mother’s community involvement and talent in folkloric dance. This young leader is thankful for her parents, as well as the other caring adults and resources that have supported her on her educational path, including CHCI. Daniela participated in R2L NextGen during the summer after her freshman year of high school, and has grown tremendously since her experience in 2012. In her words, “Since [the] program, I have only become a stronger and more responsible person.” She has exercised her leadership through various clubs at her school, including the Junior State of America (JSA) and Society for Advancement of Hispanics/Chicanos and Native Americans in Science (SACNAS). In JSA, an organization that strives to empower students to be politically engaged in their community, Daniela has served as the club’s president and has participated in several competitions. Her involvement with SACNAS, which encourages young people to pursue careers in the STEM fields, includes supporting the growth of a mentor program in collaboration with the University of Merced, California SACNAS chapter. As someone who has been positively influenced by CHCI’s R2L NextGen program, it is no surprise that Daniela has been an active high school leader in two organizations that uplift her peers. She feels a responsibility to encourage others, including the next generation. 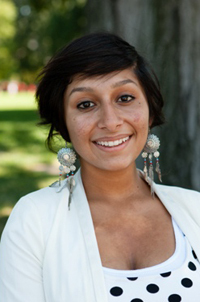 This fall when Daniela enters college at the University of California, Davis she plans to major in secondary education. Her goal is to continue to inspire and be a positive force in student’s lives as a high school teacher. Daniela looks forward to the day when she can help support her family so that her father will never again have to endure difficult manual labor. The CHCI familia is proud of all Daniela has accomplished and is excited to see the many accomplishments that will come her way as she transitions to college.